Please CLICK HERE to sign up using Audition Form. Limited drop-in times will be posted here the Thursday prior to each audition weekend. Please note that these auditions are specifically for our Shire Cast. If you are interested in joining the Enchanted Forest Performance, The Caravan Dancers or in being a stage or street performer, please refer back to out Join Us page. A tense moment between Robinhood and the Sheriff of Nottingham. MUTTON & MEAD -- SHIRE CAST AUDITIONS !!! Come audition! Tell your friends! Let’s let the party magic start to unfold! The Shire Cast is at the heart of Mutton and Mead’s interactive experience. Each cast member takes on a character or role from the story of Robin Hood, played out at our beloved Mutton and Mead Tavern of Nottingham Shire. Together these characters bring the festival and the story of Robin Hood to life through coordinated street and stage shows and semi-scripted / improvised interaction with festival patrons, including interactive street dances. In addition, members of the Shire Cast will also put on a formal show towards the close of each festival day. If you are interested in performing at Mutton & Mead this year as an independent stage or street act, send us an email at programming@muttonandmead.org for more information about how to get involved with our faire in that capacity. If you are interested in auditioning for our Shire Cast, please take some time to read the information below. We will scheduled you based on the availability you provide on the in the AUDITION FORM. We will be posting drop-in times here the week prior to auditions. This will be a general audition for all participants. Plan on the process taking about 3 hours. The audition will cover a prepared monologue of approximately one minute; we will also provide an ensemble piece on the day to provide for singing. There will also be a script reading for the potential cast members who attend. If you play a period appropriate instrument (lute, guitar, recorder and so on) and would like to make that part of your audition, please let us know before hand so that we can accommodate that request! At this time, the Mutton and Mead organization does not currently have a youth program. Therefore, auditions will be limited at this time to participants 16 years of age and older. Furthermore, the number of youth we can accept is very limited, as it will require the presence of a guardian in the cast as well. In the future we hope to collaborate with local organizations to provide opportunities for youth. WHERE: Montague Common Hall (formerly Montague Grange) 36 Main Street in Montague Center, Montague, MA. WHO: YOU!! The 2019 Shire Cast Audition Form is online here! After submitting this form, you will be contacted to schedule an audition slot. WHY JOIN: Some might say it is downright magical. You will be joining a supportive community of fun and creative performers, committed to both developing and delivering a memorable experience to our audience. Mutton and Mead offers both seasoned and novice actors, musicians & singers an exciting and dynamic environment to broaden, develop, and hone their craft. We provide our Shire Cast with training in acting technique, stage combat, dancing, singing, and improvised patron interaction. Please fill out our 2019 Audition Form (LINKED ABOVE). Once we get that, we will schedule your audition. Actors should come with a one-minute monologue and be prepared to participate in a range of improvisational activities. If you sing or play an instrument please bring your instrument and a song to present. You must provide your own music, props, and/or other materials for your audition performance. All pieces must be quick to set up, be (mostly) memorized, and should show your flair and ability to perform characterization. During the improvisational activities, we will be looking at your ability to think on your toes, help your fellow improviser, and have fun. Sing and speak loudly and clearly, smile, and relax. Put all of your energy into your performance. Your monologue will be used as an icebreaker for casting. It is an opportunity for you to show us what you’ve got, when you have an opportunity to self-direct. You will be notified if you have been accepted into the Mutton and Mead Renaissance Festival by or within 2 weeks of auditions. You will also be sent an e-mail verifying all rehearsal dates. Mutton & Mead has had years of larger casts, and years with smaller casts, depending on the demands of that year’s show. Our final decision will be based on which particular roles need to be filled and how the talents that you have to offer fit with the needs we have for the show this year. With the exception of individual characters, multiple people may be placed in the same type of role: Guard, Washer Wench, Merry Man/Woman, etc. In 2018, we will be enlarging the cast slightly over last year. If you are not cast for this year’s show. however, do not be downcast – Things certainly change from one year to the next! Also, please note on your audition form if you might be interested in joining our team of Shire Shapers: talented, hands on folks who work behind the scenes to bring our festival to life! In fact, there are many, many opportunities for volunteers – we need crew in many aspects of the festival. Once accepted, rehearsal times and days will be based on your role and worked out with the Theatrical team. All characters will travel the Faire telling stories of their adventures or plights while interacting with the faire-goers. Depending on the character they might have scripted and unscripted scenes throughout the day. Possible roles include: Robin Hood, A Merry Man/Woman, Maid Marian, Maid Marian’’s Chaperone, Maid Marion’’s ill father, King Richard, Prince John, Little John, Friar Tuck, Will Scarlett, Alan a’’dale, The Tavern Keeper, A Tavern Wench, Tavern Cook, Washer "Wench", Nobility (King, Queen, Prince, Princess, Lady or Lord), The (evil) Sheriff, Guy Gisbourne, Visiting Emissary, Sheriff”s Band miscreant, Sheriff’s (bumbling) Guard, A towns Person, The Black Smith, Black Smith’’s Son/Daughter, Hopeless Minstrel, Miserably Doomed townsmen/woman, The Executioner, the Surgeon Barber, the Medicine Woman, The Captured Merry man/woman, An Honest Thief, Snooty Upper-class Lady/Lord, Benevolent Noble, The Town Tinker, Spy to the Sheriff and so on. Fighters: In addition to interacting with fair-goers, these performers will engage in choreographed, staged combat at prescribed times. These characters will be trained in safe stage combat techniques. People who might be cast in Fighter roles will need to attend a follow-up Fight Team Tryout the next weekend. At that tryout, stage fight skills and readiness will be formally assessed. Musical Talent: Music is an integral part of our cast shows and festival. We offer training and guidance based on your level of skill and desired involvement. Dance: What kind of festival would it be without dancing? We incorporate dance in our shows and teach our cast a number of period or period-esque dances to do throughout the day. We also take time during the day to teach the festival’s patrons some simple dances they can put to use when the mood strikes them. Depth and Color: These improvisational street performers roam the faire while interacting with the fair-goers. They provide unscripted entertainment and may assist in providing Faire information as well as story line updates. There are two phases of our production. Additionally, there are opportunities (and expectations) for cast to help behind the scenes as crew, in all aspects of the festival! There are especially opportunities for “all hands on deck,” in the weeks just before and after, with set-up and breakdown. Rehearsal Phase: Rehearsals are held May through dress rehearsal weekend and “heaven” week just before the faire. 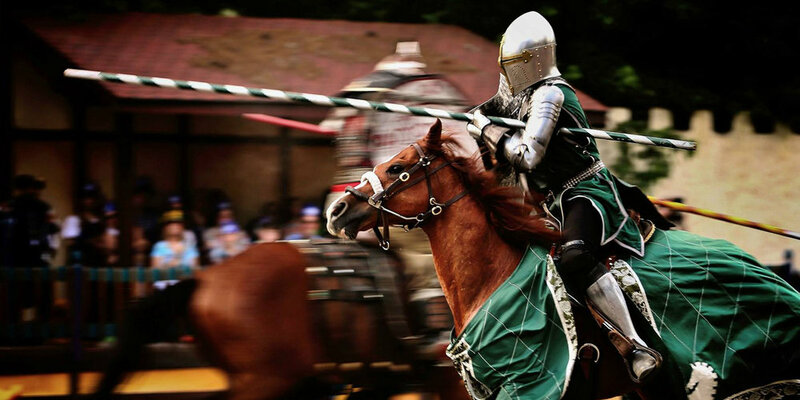 Workshop Phase: At workshops, we provide overall foundation in medieval history and culture, renaissance faire orientation, character development, improvisation, period dialect, public interaction, stage combat, dance, and voice. This is where we learn about the festival process and about each other, and begin to pull together the different threads of the personalities who together create our Shire this year. Rehearsal Phase: At rehearsals, we prepare for this season’s show. It will be your responsibility to learn lines and song lyrics, and to practice in between rehearsals to improve your performance. Rehearsal Phase: At rehearsals, we prepare for this season’s show. It will be your responsibility to learn lines and song lyrics, and to practice in between rehearsals to improve your performance. A second, cast only audition (not rehearsal, as stated) will be held at the end of April for the scripted show, but all cast members will work in ensembles which emphasize techniques for outdoor theater in the round: special attention will be paid to vocal projection, blocking, and awareness of the presence and participation of the patrons we mingle among during these shows. We practice use of dialect, choreographed fights and dances, learn all songs for a Tavern Sing and other work in specific performance groups. We teach ways to keep your body safe and healthy performing outdoors, especially during hot/humid weather. We will also continue to assist you in character development, dialect, improvisation and effective interaction with your fellow performers and festival patrons throughout the rehearsal phase of our festival. Thank you very much! If you have any questions we have not yet covered- send us a message.